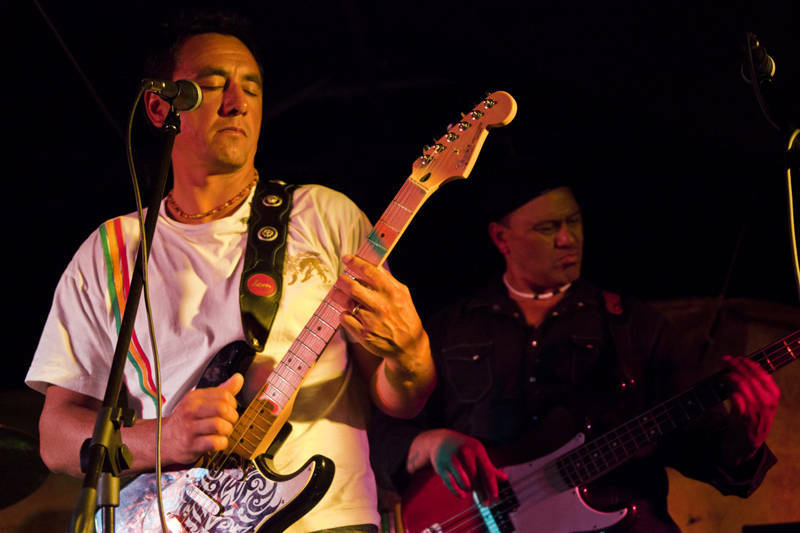 This is Albany band Manaia who Rocked Hopetoun last night with their own brand of Reggae, Funk and Groove. After the gig the guitarist ask if I could get them a gig in the UK. Unfortunately it’s been 10 years since I put on gigs in Nottingham and I think persuading a venue to fly five guys half way round the world is beyond my ability. I wish them the best of luck and if they make it I would gladly pay to see them play again. The last 25 posts I have been experimenting using sRGB colour space. From now on I am switching back to Adobe RGB as the last two low key gig shots displayed a lot of visible noise in the shadow areas when viewed using Firefox browser. Redeveloping theses images in Adobe RGB colour space has greatly reduced the distortion. I suspect this is due to the wider colour range of Adobe RGB being clipped to display on the web. The clipping will increase the amount of pure black in the picture which makes the image punchier and eliminates the dark grey noise. I normally only photoshop and post one image each day. I thought this one came out best. If you want a shot of someone in particular let me know.